Winter's arctic blasts aren't over yet, and when the temperatures get cold many turn to space heaters and electric blankets to stay warm. The Safe Electricity program provides tips to help consumers make sure they're using these devices safely in order to help protect their homes and families. ... electric blankets and space heaters are very helpful in helping many stay warm. However, they can also cause fires if they are not used with care. This week has started out with more frigid temperatures. In fact, many have reported daily record lows, and winter’s arctic blasts aren’t over yet. When the temperatures get this cold, many turn to space heaters and electric blankets to stay warm. The Safe Electricity program reminds consumers to make sure to use these devices with caution in order to keep homes and families safe. “When winter temperatures get frigid, electric blankets and space heaters are very helpful in helping many stay warm. However, they can also cause fires if they are not used with care,” explains Molly Hall, executive director of the Energy Education Council and its Safe Electricity program. According to a National Fire Protection Association study, in 2010 space heaters accounted for 32 percent of the 57,100 reported home fires and 80 percent of deaths caused by home heating equipment. Don’t become a part of these statistics. Begin by checking space heaters and electric blankets before use. Cords should not be frayed, brittle, or cracked. Always remember to turn off space heaters and electric blankets when not in use. Never leave one of these devices on unattended or after going to bed. Many fires start when flammable products are placed too close to heating devices, such as space heaters. Space heaters should be kept at least 3 feet from blankets, clothing, paper, and other flammables. Place space heaters out of high-traffic areas and on a level, hard, non-flammable floor surface — NOT on carpets, furniture, or countertops. Look for a space heater that has guards from heating elements and automatically shuts off if it is tipped over or overheating. Do not attempt to warm your entire home using only space heaters. 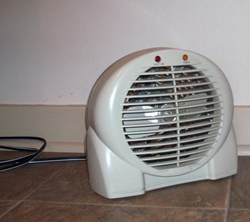 Space heaters are useful in small areas, such as a study or living room. However, if you need to keep large areas warm, your home heating system will do the job more efficiently. Plug space heaters directly into the outlet, and never use an extension cord. Only use electric blankets with an automatic shut off designed to prevent the blanket from overheating. Pets should never be allowed to sleep on top of electric blankets. Electric blanket wires should never be bent or tucked under a mattress. Replace old or damaged electric blankets. The blanket should not have any charred or dark areas. When shopping around for space heaters or electric blankets, be sure to check for safety certification marks to verify that the product has been tested for safety. Look for UL, ETL, or CSA marks, for example. Once you have made a purchase, make sure to fully read and follow the user instructions before using either product. To learn more, visit SafeElectricity.org.